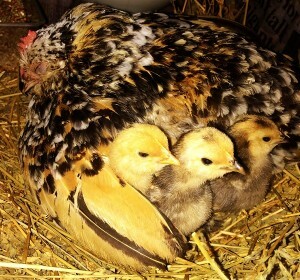 Freckles had just moved to Blue Gum Farm with her newly hatched chicks. The chicks were tiny little balls of fluff and Freckles spent most of the day keeping them safe and warm under her feathers. After about 2 weeks the chicks started to sprout little feathers of their own and were becoming more independent as they grew bigger. It was Freckles’ favorite spot to scratch and hunt for insects under the Macadamia tree at the back of the farm house. One morning they were under the Macadamia tree when Freckles noticed something was wrong. She fluffed up her feathers and gave a very definite “squark” to her babies to let them know she sensed danger. Up in the branches of the Macadamia tree were perched two Kookaburras. Freckles began to squark louder to warn the Kookaburra’s that she was watching them and she would protect her babies if either of them tried to swoop down to peck them. From the farm house Cilla heard the commotion and knew that Freckles only made that sound when there was danger. She rushed out to see what was happening only to find Freckles alone among the leaves. 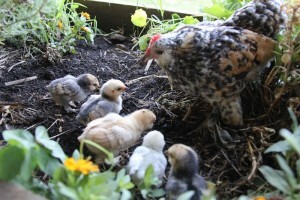 The chicks had disappeared! The Kookaburras had flown away and there was no sign of the chicks anywhere! Cilla panicked. “Freckles, where are all your babies?” she said, thinking the worst and that the Kookaburras had taken them. 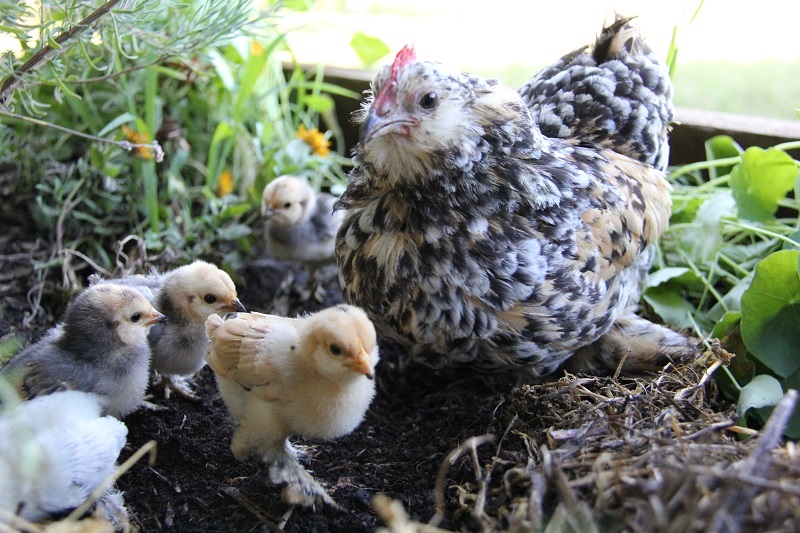 After a few moments the leaves around Freckles began to rustle and, to Cilla’s amazement, out popped all the chicks from beneath a thick cover of Macadamia leaves. Freckles had hidden them all out of sight and safe from danger. “Freckles you clever chook” Said Cilla, still amazed. Freckles continued scratching happily in the leaves and the chicks joined in once more. She had known just what to do to trick the Kookaburras and keep her babies safe.